The Athens County seat is the City of Athens, which is home to Ohio University. Roughly 25,350 county residents live in Athens, 5,300 residents live within Nelsonville and the remaining 37,350 residents live in the county’s villages, towns and unincorporated areas. 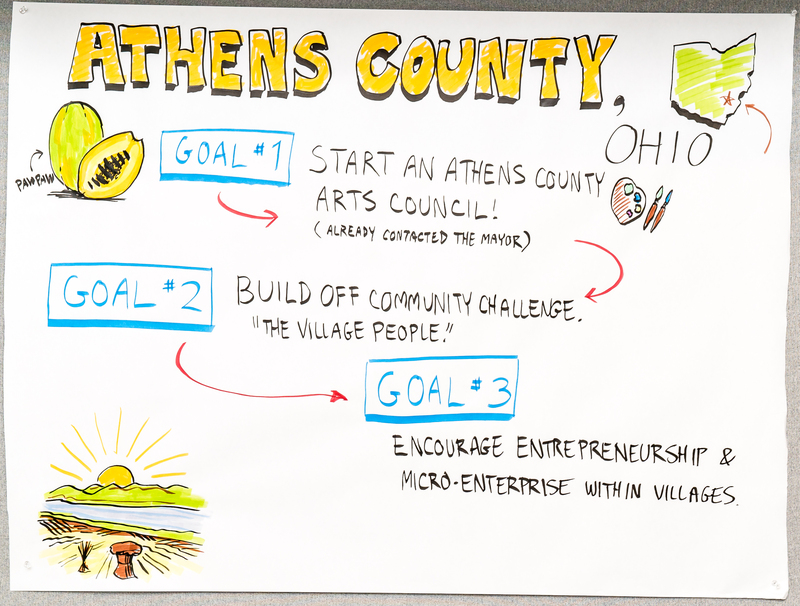 Athens and Nelsonville are the centers of arts and culture in the county, with well-developed arts policies and programs. While nearly all villages in the county host an annual festival or cultural event, many of the county’s smaller communities lack the capacity, time, staff, funding, infrastructure and/or knowledge to pursue community development and programming. In 2017, the Athens County Community Challenge program was piloted to provide services to these smaller communities. Through its challenge events, the county aims to empower residents to identify, create and be involved in making improvements to their community. The county now plans to create a county-wide arts organization and include the arts in its community challenge program. Goal #1: Create a county-wide arts council. Create a communications plan, including a press release to annouce project and communicate goals to stakeholders. Hold a public arts meting to help identify all possible stakeholders, gain input and support and conduct a Power of 10 activity so that stakeholders agree on measures going forward. Hold working groups to identify goals and actions as move forward. Goal #2: Utilize the community challenge model to build local capacity and leadership. Structure an arts program in each community challenge. Implement the community challenge program. Goal #3: Create a microenterprise around Creative Placemaking. Host a training and informational meeting. Create the structure of the program . Provide ongoing business support to grow and sustain the creative industries in each village and challenge team.